One of the best ways to give any room in your home a quick update is to change the window treatments. Roman Shades, in particular, are a good place to start when it comes to home improvements. They are an attractive and sophisticated window treatment option which offers a number of advantages. Roman shades are classic window treatment options that has been around for centuries. When lowered, they sit flat against the window; but when they are raised, their pleats stack uniformly on top of each other. The simple and elegant design makes them an appealing option for any room. Below are the top five advantages of these classic shades. The most appealing aspects of roman shades are their timelessness and versatility. They can be casual or formal and masculine or feminine, ensuring that they will easily fit into any room that you choose. Their clean lines will also lend any space an element of sophistication with ease. After all, they have been used for centuries across Europe and North America. 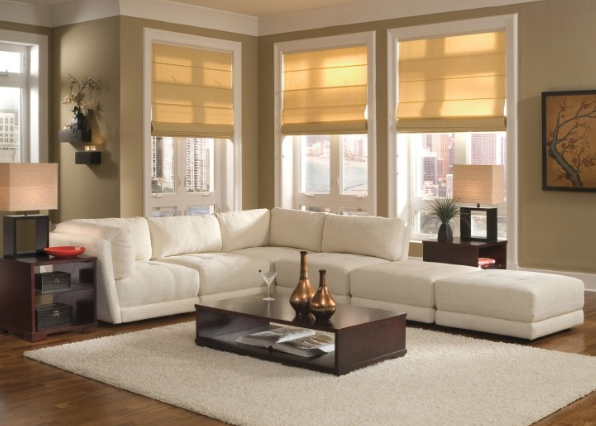 These shades are also a great place to start if you are unsure what kind of window treatment to look for. Another appealing feature of these shades are their simplicity. Their simple design allows them to fit in any room. These shades can come in a variety of colours and materials, so you’ll never worry about having shades that don’t quite match. Roman shades might also be of interest if you’re looking for more control over energy usage in your home. When Roman shades properly fit a window, they effectively limit the light that enters the room. By blocking light out of the room, these shades can help you keep your room cool without turning on the AC. Alternatively, they also offer additional insulation for drafty windows during colder months. If you are thinking about using Roman shades to increase energy efficiency, be sure that you choose ones made of heavier fabrics and materials with tight weaves. Roman shades offer significant privacy to homeowners and can also reduce outside noise thanks to their intelligent design. They are designed with the intention of staying in place, unlike other curtains which can easily get caught up in a breeze through an open window and blow around, reducing the privacy of those inside the room. Each Roman shade comes as a single unit with internal stiff bars creating their divisions. This helps to keep them in place and to be unobscured by wind and other outside factors. The material that the shades are made of will also affect the level of privacy: dark and tightly woven fabrics are particularly good for more privacy. These shades are easy to use for anyone. There’s no handle twisting or tricky angles required to lower or raise these shades. Roman shades are usually controlled by an internal gear system that allow homeowners to raise the shade’s folds and have them stack over top of each other until they are completely raised. Lowering them is just as simple and involves gently pulling them down. This is the safest option for households with small pets and young children because it removes cords which can be safety hazards. That being said, cords are an option for those who still prefer them as well as automated window blinds. Roman shades are great window treatment solutions for any home. They are sophisticated and timeless shades that offer increase energy efficiency, privacy and better home safety. As well, they come in a variety of styles that would enhance the look of any room.